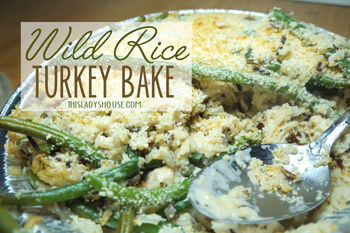 Mix rice, turkey, green beans, and Alfredo Sauce in a large bowl. Place in dish. Place bred crumbs in small freezer bag. If thawed, bake at 350 for 30 min. Put bread crumbs on before you cook and cover. This entry was posted in Recipe and tagged Dinner, Freezer, Poultry.